This section defines terms and concepts used in the scope of RadToolBar you have to get familiar with prior to continue reading this help. They can also be helpful when contacting our support service in order to describe your issue better. For more detailed descriptions of the required parts of the control please visit the Required Parts section. Strip panel - The main area that holds items - buttons, etc. 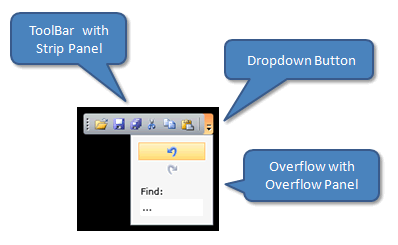 Dropdown Button - A button to act on in order to open/ close the Overflow. Overflow panel - The area that holds all items not located in the Strip panel.